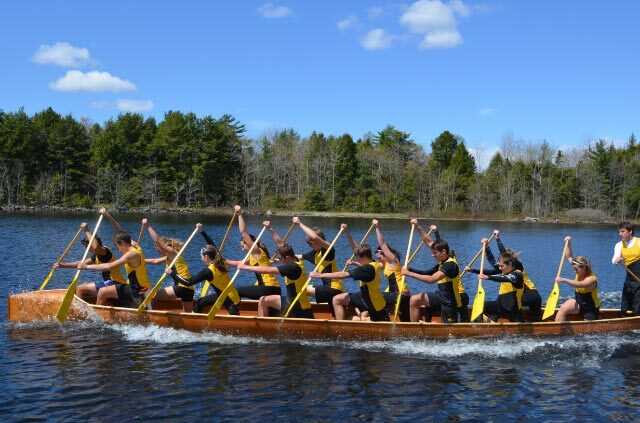 This 30' cedar-strip 15-person canoe (C15) had its launching and inaugural paddle on May 12th of this year. After the launching it was shipped to London, England to participate in a parade of indigenous canoes from around the World that takes place each morning before the Olympic paddling events begin. The crew who will be paddling the boat—14 paddlers and their coach as coxswain—won the right to represent Canada last Summer at the National Canoe Kayak Canada championships in Welland, Ontario. The paddlers are from the Cheema Aquatic Club in Waverley, Nova Scotia. The boat may go to the Italian Canoe/Kayak Federation after the Olympics. As no plans exist for these boats, the forms had to be devised to meet the specifications and limitations set by the Canoe Kayak Committee. These parameters state that the section and longitudinal line of the canoe shall be convex, the maximum length is 30′ with a minimum width of 36″ at the 11″ waterline. A keel, if any, must extend the full length of the canoe and not project more than 30mm (1″ plus) below the hull. The minimum allowable weight is 190lbs. Robert Fraser designed and built this canoe, strip-planking the hull with full length strips milled from a clear red cedar board 32′ long that had grown in British Columbia. He constructed the front deck by continuing the hull stripping up over the top. He used ash for the keel and mahogany plywood for the floor. He built the rails out of ash and jatoba, with jatoba also at the stem. The yoke at the stern is from a slab of elm.